New Government of the Republic of Kalmykia started its work. Head of the Republic of Kalmykia Alexey Orlov has appointed new Ministers. 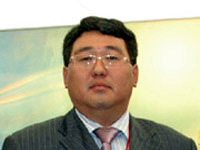 Lantsanov Peter was appointed First Deputy Prime Minister of the Republic of Kalmykia – Minister of Agriculture of the Republic of Kalmykia. Today, Head of the Republic of Kalmykia Alexey Orlov sacked the government of the Republic of Kalmykia, reports KalmykiaNews. Today, 28 October 2011 in the main conference room of the Government of Kalmykia, a solemn ceremony awarding large families – of documents on state registration of title to land in Kalmykia.